Cerianthus sp., white light. (c) Jim Obester. Most of the fluorescence images we see come from warm places like the Caribbean and Indo-Pacific, but Jim captured this shot in the cold, dark waters of the Pacific Northwest, with visibility anywhere from a few feet to 30 feet or more. His favorite spot, and where this shot was taken, is Sund Rock in Hood Canal, just north of Hoodsport, Washington. A typical dive will have a variety of life, including decorated warbonnets, cloud sponges, wolf eel, giant pacific octopus, and of course tube-dwelling anemones. According to Jim, to get his 1st place shot, he “tends to shoot hovering over the anemones to keep silt down and waits for the arms to be in the same plane.” He shot the picture using his Nikon D800 with a 105mm f2.8 Nikon macro lens in a Nauticam housing, SEA&SEA YS-D1 strobes fitted with NIGHTSEA EX-YSD1 excitation filters, and a Tiffen Yellow #12 barrier filter on the camera port. He uses the Sola NIGHTSEA high intensity blue led dive torch from Light & Motion to search for subjects. 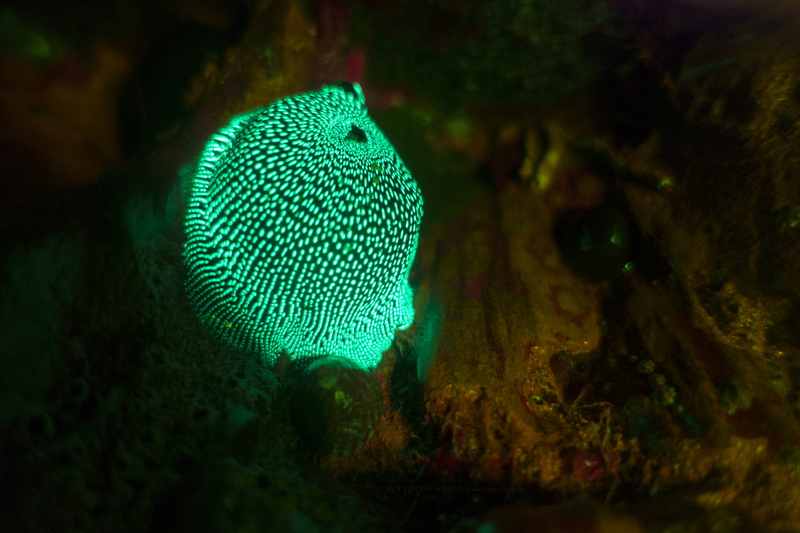 The somewhat dark dive conditions of the Pacific Northwest are ideal for daytime fluorescence photography – which is exactly what Jim enjoys doing. You can see a video of Jim in action taking fluorescence photographs here. Fluorescence is certainly becoming more mainstream! There were two other underwater fluorescence entries in this contest. One of those also came from cold water – Vincent Hyland’s beautiful shot of a strawberry anemone fluorescing under blue light excitation in Ireland’s Atlantic waters. 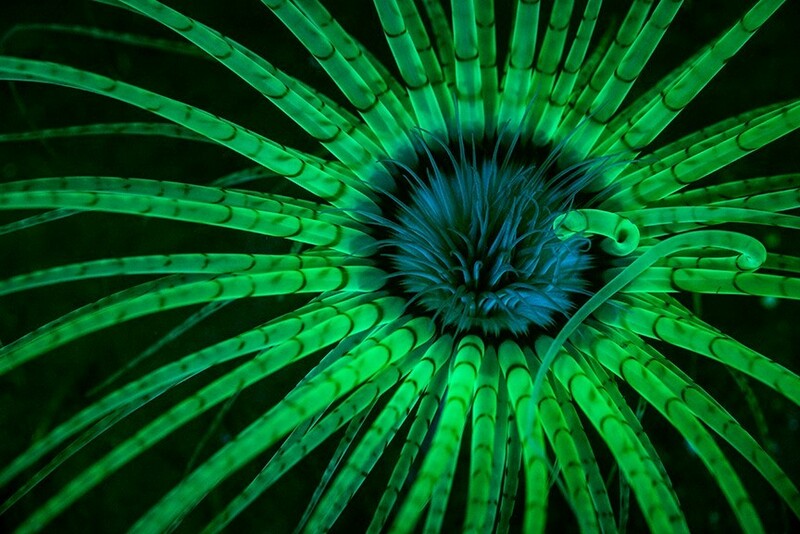 Not to leave the warm waters out, Jeff Honda submitted this stunning fluorescence image of an anemone in Bonaire. 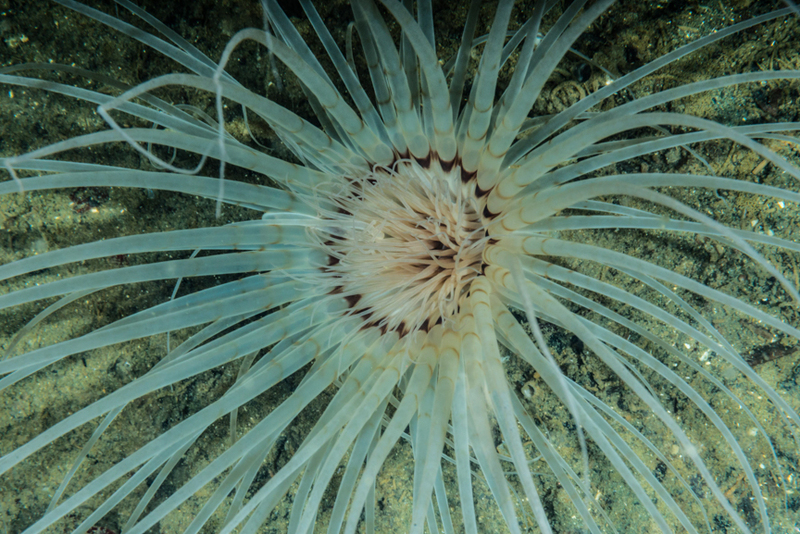 The anemone pictured is normally a plain beige hue under white light. When it gets exposed to blue light, it explodes with color. Congratulations to all of these underwater shooters who are bringing the hidden spectral world of fluorescence to the world audience.